Some prayer warriors of Nigerian extraction have effectively prayed self out of poverty, lack, sickness, madness, infertility etc while the nation is still backwards, sliding deep into, poverty, insecurity, inequality, injustice and despair. The Nigerian praying system enthrones a prosperous church while the nation is in a state of backwardness. Some prayer warriors of Nigerian extraction have effectively prayed self out of poverty, lack, sickness, madness, infertility etc while the nation is still backwards, sliding deep into, poverty, insecurity, inequality, injustice and despair. This is the mystery of Nigeria prayer system- some individuals are prosperous while the nation is backward. The earlier article ‘’Hypocrites as prayer warriors: How can God heal Nigeria?1 & 2’’ laid the foundation for the discussion and attempts to distinguish between personal prayers and corporate prayers . The principles of corporate prayers, prayers for nations, cities, villages emphasizes that the prayer warrior must stand on the path of equity. Any prayer against corrupt public officials cannot work if those praying have the same corrupt tendencies exhibited by those they want to replace. A lot of prayer warriors have been given divine opportunity in the past to lead their constituencies to the Promised Land and there was no evidence in the manner they administered public trust to suggest that they ever prayed. Former president Olusegun Obasanjo turned a Born Again prayer warrior while in Maidugeri prison. When he became the president of Nigeria in fulfillment of the earlier prophesies of Bishop Duncan Williams of Ghana, the major achievement of his prayer prowess is that he frustrated the presidential ambitions of the feared Nigeria’s self styled evil genius, former military president Ibrahim Babangida in 2003, 2007 and 2011 and publicly declared Babangida a fool at 70 . He also introduced a ‘do or die’ electoral fraud system. His predecessor, late General Sanni Abacha so much believed in prayers that while he and his marabous were enchanting in the State House, his lieutenants were harassing, imprisoning and assassinating political opponents, irrespective of religious affiliations. There are many in Full Gospel Fellowship, Grace of God Mission, Assemblies of God Church, Living Faith Church , Redeemed Christian Church of God, EFAC members in Anglican Church, Adoration members in Roman Catholic Church, Knights of Catholic, Anglicans, Methodists who have occupied positions of trust either as Senators, Governors, Ministers, Ambassadors, Party Chairmen , Permanent Secretaries, Heads of government agencies and yet there is no evidence that these people ever knew God nor had conscience in the manner they looted the national treasury and impoverished the masses, except probably that they donated to the building of church cathedrals and maintenance of the parsonage. Their Muslim counterparts have not fared better; the level of poverty they hoisted on the majority of their people in the northern parts of Nigeria is evidence of years of prayers, sallat, pilgrimages to Mecca, Medina and other sites of worship. They are in corrupt enrichment contest with their christian counterparts in the civil service, politics, economy and other spheres of national life. When some muslim adherents got tired of following insensitive leadership, they formed Boko Haram as a means of liberation, visiting mayhem on the nation. The majority Sunni sect has a lot of super rich members. The minority Shia and Ahmaddiya sect members boast of equally affluent members in the society. The rate at which individuals build gigantic mosques attached to their homes and in their remote villages suggests increased financial prosperity. The prayer warriors of Nigerian extraction have effectively dribbled self out of poverty, lack, sickness, mental illness, infertility etc while the nation is still backwards, sliding deep into, poverty, insecurity, inequality, injustice and inhumanity. Some have gotten breakthroughs in career, promotions, demotion of enemies and completion of abandoned projects, academics, marriage. 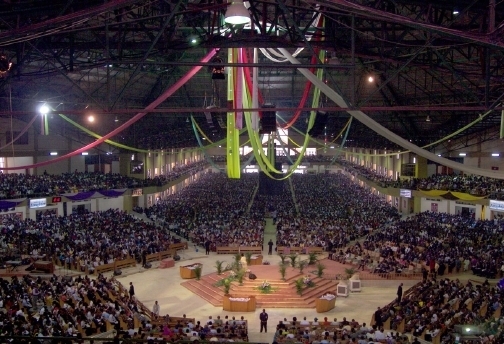 All the spiritual pilgrimage programmes in Nigeria such as Holy Ghost Congress, Shiloh, Power Must Change Hands, Adoration and numerous crusades have no doubt salvaged a lot of members from the grips of invincible forces; and lot of evidences of divine intervention and verifiable miracles are not uncommon in those and other spiritual centers. In essence God hears the personal prayers of Nigerians for a better personal life but when it comes to extending such to national life, the same God shuts the door. Something is wrong somewhere. Therefore we have a lot of financially successful orthodox and Pentecostal Christians who must solicit the blood of Jesus for robbers and kidnappers not to gain entrance into their mansions. These wealthy personally blessed Christians must constantly change the shock absorber of their brand new cars and waste precious time on mechanics because the inept leadership have handed down bad roads to everyone irrespective of whether the person is a prayer warrior or not. The wealthy Christian must spend some hard earned money to bribe his wards into the university because the scarcity of university space, occasioned by bad leadership has made the admission process a highest bidder exercise. Nigerian prayer warrior have succeeded in the areas of personal deliverance, personal prosperity and healing, however, they are still frisked like criminals at the point of entry to many nations because of negative image which leadership mediocrity have hoisted upon the citizens. Is it not preferable to have a nation where the generality of people live above poverty level with a few super rich than the present situation where the majority live in poverty and a few successful prayer warriors live in opulence surrounded by hungry, angry and hostile mob? The spiraling prosperity fixation in the churches is building a super capitalist system which is gradually dwindling into a contemporary feudalism. This is not the prosperity preached by Jesus Christ. The Nigerian church have no doubt prospered financially and have removed the toga of a church rat but the nation where the church is located have moved down in corruption index to being 143 out of 182 most corrupt nation in the world( according to Transparency International 2011 report). We thank God for prosperity in the churches but why the nation has not witnessed economic transformation is a mystery. There is something wrong with the prayers offered for Nigeria- it is the hypocrisy of those leading and other participants in the prayer bouquet. God’s word says in ‘2 Chronicles 2vs 14 ‘’if my people, which are called by my name, shall humble themselves, and pray, and seek my face, and turn from their wicked ways; then will I hear from heaven, and will forgive their sin, and will heal their land’’ . Until those praying for Nigeria repent from their wickedness, humble themselves and seek national justice, equity, fairness and shun all tribal and sectional bias in the assessment of all pending national issues, the prayers for a nation where rule of law, economic prosperity and social security abounds will not be answered. The self centered personal prosperity craze of the Nigerian prayer warrior at the expense of national rebirth, national transformation and national development will certainly lead Nigeria into a banana republic populated by very few super rich church goers with their subservient beneficiaries and an overwhelming majority held hostage by corruption, nepotism, armed robbery, kidnappings, communal strives and hunger. A prosperous church cohabiting with a backward nation is a social time bomb capable of exploding anytime.